Welcome to San Diego's newest source of aquatic fun and fitness! This just in! Hydrobike Bootcamps on Mission Bay! Hydrobike Bootcamp instructor Jana Valesova’s professional mountain biking and Pilates experience brings a high-energy cycling vibe to Saturday classes! There’s no exercise class like it in all of San Diego, possibly the entire universe! Friday mornings from 9am - 10:30am with the dynamic wellness expert and doctor of chiropractic, Dr. Austin. Saturday mornings from 9am - 10:30am with former professional mountain biker, certified personal trainer, mat and reformer Pilates instructor, and cycling coach, Jana Valesova. Both inspiring instructors will get your heart pumping and mind relaxed with an outdoor, on-water fitness experience like no other. Suitable for all fitness levels, and the small class sizes guarantee personalized instruction. Only 35 dollars for an hour and a half of instruction, motivation, and blissful cycling on the water. Hydrobike and life vest included. Waterproof shoes, sandals or bare feet recommended as the class includes a beach landing and workout on the sand in Mariner’s Basin as well. Please visit our partner Wellness Lounge or call (858) 245-6049 to enroll. 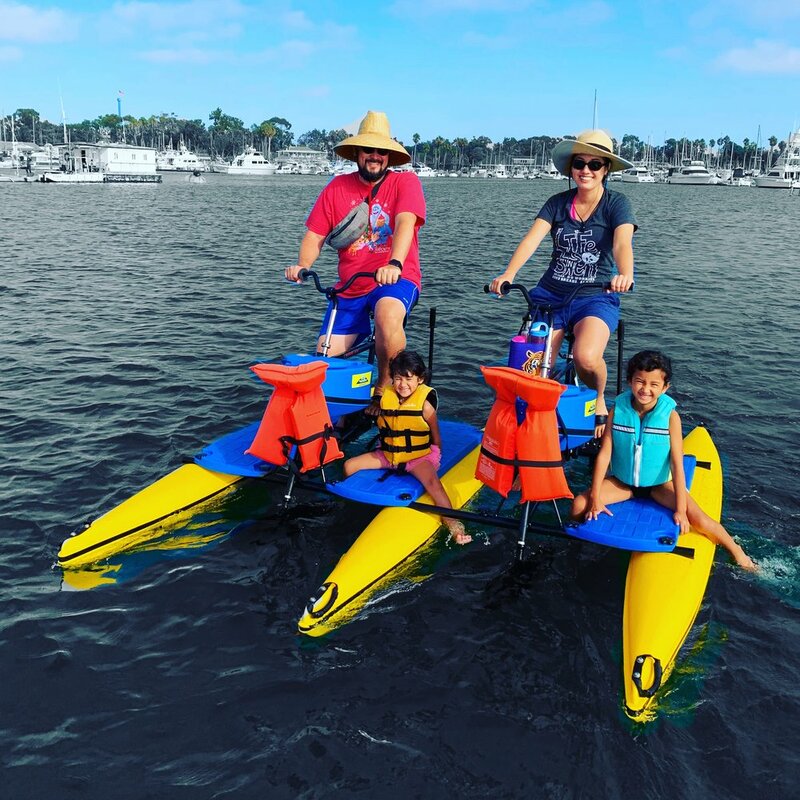 Fun, safe and untippable, our water bikes have been a favorite way to experience the water from kids aged 2 to 90! An average-sized 7-8 year-old can reach the pedals. Younger children can ride with parents for free. Give us a call to discuss options. We know it can be hard finding fun things to do where you can bring your dog with you. We have you covered! Hydrobikes are super dog friendly, and your furry friend will love the ride and interaction with the seabirds and marine life. We have life vests for dogs of all sizes, free with your rental. Great for fun family adventures! Are you looking for some fun things to do with your family? We have the answer! Hydrobikes are easier to ride on the water than a bicycle on land. Adventurers aged 2 to 90 and have enjoyed our bikes. They're a great way to have fun in San Diego and spend quality time with family. We couldn't be more excited about partnering with our friends over at Aqua Adventures. This veteran-owned business features kayaks and paddleboard rentals and retail sales, lessons, tours and an all-around good vibe on the best spot on Mission Bay. Lots of free parking and after ride massage and snacks available too! Full restaurant with San Diego’s best fish tacos and great craft beer selection coming soon! Questions? Special requests? Send us A message. Copyright © 2019, Hydrobikes SD LLC. All rights reserved.